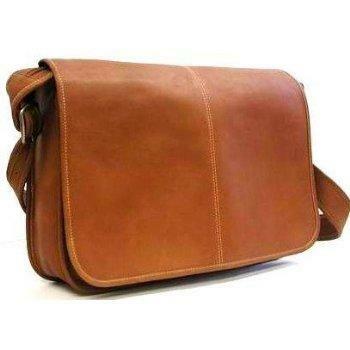 A men's leather messenger bag can be the perfect solution for the man on the go! Organization: In terms of organization, few accessories can beat the messenger bag. Everything you may need for the day, whether it is important paper work, or reading materials, will be right there at your finger tips. Additionally, you can also store other items, such as keys, a water bottle, or your wallet. Looks Professional: Whether in a creative field or in a business oriented one, few would doubt that a men's leather messenger bag looks more professional than a classic backpack. While it's true that a backpack or book bag will most certainly hold your gear as well as a messenger bag, it may not look as professional, and that can give your supervisors the impression that you don't take your job seriously. If you do take your job seriously, this bag can further help you convey that. Won't Compete with Attire: A finely crafted messenger bag won't compete with your work attire. This can hold true even if you are wearing a business suit. Amazon offers several different bags, one of which is the Le Dune Quick Access Vacquetta Leather Messenger Bag. This handcrafted bag features two large slip pockets that are hidden under the fold over flap, a dual compartment for extra storage space and a separate compartment for cell phones, business cards, wallets and the like. An adjustable strap completes this $125.00 look. Another bag worth investigating is the Piel Urban Messenger Bag. Slightly cheaper at $118.00, this messenger comes in three colors- black, Saddle and chocolate, and features double magnetic opening that leads to a large main compartment. This fashionable bag is rounded out by front and back zip pockets and an adjustable strap for convenience. Finally, there's Kenneth Cole's Reaction Columbia Single Gusset Messenger Bag. The price range here is between $92.50 and $260.00, and while that may seem a bit steep, keep in mind that Kenneth Cole usually offers quality goods that tend to last for some time. At L.L. Bean, you'll be able to find a large leather messenger bag. Designed as an all-purpose bag, this messenger is perfect for either business or travel. It also has an adjustable strap that can be worn on the shoulder or you can carry the bag by its handle. It comes in mahogany and is made from American rawhide leather. You can expect to pay $199.00 for this bag. Fossil has long been known for their small leather goods, and their messenger bags are no different. Several different bags are available here, one of which is the Cory E/W Messenger. This is a washed leather that is supple to the touch, and that culminates in an authentic, vintage feel. As zippered bag, you can also expect the security that comes with a tightly sealed bag, as well as interior pockets for one's cell phone, and other small electronics. To be sure, messenger bags are definitely an asset and are rarely a liability. These bags are attractive and professional looking, and convey a sense of pragmatism that is welcomed in the professional world. Take your time in choosing a bag and do your research. Doing so means ensuring that you'll find the leather messenger bag that is perfect for you.